The Edgar Thomson Steel Works, by William Rau, Braddock, PA, 1891. The Rustbelt runs right through Pennsylvania, the former heartland of American heavy industry. Throughout most of the nineteenth and twentieth centuries, coal, iron, steel, railroads, and petroleum formed the basis for giant industries that dominated the economic landscape of the state. However, in addition to these industries, Pennsylvania was home to a remarkable diversity of enterprises that served the commonwealth, the nation, and the world. This unusual feature of Pennsylvania industry was the result of many factors some of which dated back to the founding of the colony by William Penn, who promoted its rapid development by allowing settlers from many regions in Europe, especially Germany. By the mid-18th century Pennsylvania was perhaps the most diverse society in the world. What united most of these colonists was an enterprising spirit, which, when combined with a lot of hard work, made Pennsylvania into a prosperous place containing a large number of businesses that produced a wide variety of goods. Broadside advertising the "Pioneer Fast Line," 1837. Reliance Transportation Company lithograph, circa 1836. The general pattern of the state's industrial development had been established by the Civil War, characterized by, "a great variety of manufactures well scattered." Since many firms served primarily local markets, Pennsylvania industry consisted of an unusually large number of companies. For example, in 1860, Pennsylvania and Massachusetts had similar industrial employment and output, but Pennsylvania had three times as many establishments. Nearly a century later, two-thirds of all the varied types of industrial commodities manufactured in the United States were produced in some quantity in the Keystone State. It would be this industrial diversity that would sustain the state's economy when the formerly dominant industries declined in the latter part of the twentieth century. The distinctive industrial economy of Pennsylvania was in part shaped by the state's geography, resources, and early development. As settlers moved inland slow and expensive transportation by horse and wagon forced farmers to depend on locally produced goods. The many Appalachian mountain ridges that traverse the state made overland transport even more difficult, until the Transportation Revolution–bringing steamboats, canals, and railroads–in the first half of the nineteenth century began to connect the numerous regions of the state. Improved transportation made it possible for many Pennsylvania manufactures to grow into industries that served regional if not national markets. To support the economic development of the state, the Pennsylvania government had in the 1820s and 1830s funded an extensive and expensive canal system. The coming of canals and railroads did much to integrate the state economically, but some areas were still by-passed. Lumber mill with log pond in Norwich, McKean County, PA, circa 1890. In addition to the influence of its mountainous topography, the waterways of Pennsylvania were also responsible for shaping the industrial geography of the state. 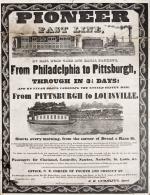 The two major centers of production–Philadelphia on the Delaware and Schuylkill Rivers and Pittsburgh at the junction of the Monongahela, Allegheny, and Ohio rivers–had started as important transportation hubs and centers for trade. (The state's other major river, the Susquehanna, flowed south linking the central part of the state to Baltimore.) As the population of these cities grew, they became home to manufacturers of goods for local, regional, and sometimes national and international markets. Urban skilled craftsmen provided the technical expertise upon which industry would later build. Fortunes made by artisans and merchants would in the nineteenth century provide the capital needed for industrial enterprises. Most of Pennsylvania's first industries developed from the state's natural resources. Grist and saw mills soon appeared in pioneer communities to grind grain and saw lumber. Pennsylvania was covered by mature forests that had grown on what turned out to be excellent farm land. Both milling and lumber would be significant industries in the state until the twentieth century. The abundance of timber near the ports of Pittsburgh and Philadelphia made both cities into centers of shipbuilding that prospered until the post-World War II era. The mineral resources of the state stimulated the development of other industries, usually located near mines or quarries or along major transportation routes. Cylinders of window glass stored ready for flattening, circa 1910. During the colonial era, Pennsylvania led the colonies in iron production–utilizing abundant sources of iron ore, limestone, and charcoal derived from wood. In the nineteenth century, the state led the nation in iron and steel production, in part due to Pennsylvania's immense coal resources–first anthracite in the northeast and later bituminous in the southwest. Available cheap energy was a valuable resource that allowed the state to be a leader in the glass, brick, and cement industries. For example, the Pennsylvania oil industry created by-product natural gas that fueled the expansion of the glass industry in the Allegheny River valley beginning in the 1880s. Timing was also an important factor in the development of Pennsylvania's industries. Starting with the aggressive development policies of William Penn and his successors, Pennsylvania got a head start in many fields. Textiles provided another essential industry in which Pennsylvania established an early position. The mechanization of textile spinning and weaving launched the Industrial Revolution in Great Britain in the 1770s, and Americans followed its lead several decades later. In the United States, the mass production of inexpensive cotton cloth became centered in Lowell, Massachusetts. Philadelphia textiles focused on woolen, silk, and hosiery markets. After 1840, farmers in the western part of the state began to raise sheep, whose wool was spun and woven in local mills. The absence of southern cotton during the Civil War led to a dramatic expansion of the state's woolen industry. By 1880 virtually every county had at least one mill and Pennsylvania surpassed Massachusetts to become the leading producer of woolen goods. Carpet loom, Hardwick and Magee Company, Philadelphia, PA, September 17, 1925. The textile industry in Philadelphia consisted of a large number of mostly small establishments that produced a wide variety of fabrics. Carpet weaving started in Philadelphia in 1791, and by 1810 the city had a virtual monopoly. The introduction of the Markland power loom in 1868 helped Pennsylvania become the leader in carpet manufacture between 1870 and 1900. In cotton goods, Philadelphia concentrated on intricate and fancy fabrics, frequently woven on handlooms. After 1880, silk spinning, weaving, and knitting factories began to appear in eastern Pennsylvania to take advantage of cheap female and child labor provided by immigrants whose adult male breadwinners worked in mines or mills. By 1900, one-third of America's silk textiles were made in Pennsylvania, mostly in Philadelphia, Scranton, and Allentown. In that year, textiles was the number two industry in the state, and Pennsylvania was number two in the United States, not just in textiles but in manufacturing generally. As the twentieth century began, while most Pennsylvanians benefited from the wide variety of goods that poured out of the state's mines and factories, some citizens, especially those who called themselves Progressives, increasingly worried about the negative aspects of industrialization. In its pursuit of economic growth, state government had tolerated long hours and low wages for workers, permitted unsafe working conditions, and chose to do very little about air and water pollution caused by industry. In addition, Pennsylvania politicians had been unduly influenced by wealthy businessmen, who had frequently used unscrupulous and illegal tactics to amass their riches and power. Progressives pressured government to regulate industries to ameliorate some of these consequences of Pennsylvania's–and America's–headlong and often reckless industrialization. Increasingly government responded with laws that restrained business practices, established rights for workers, and protected natural resources and the environment generally. Although Pennsylvania continued to be an industrial powerhouse in the twentieth century, its national prominence began to decline after 1920. As transportation improved and economic development became more widespread, industrial production tended to move to the west and the south. Between 1900 and 1910, production of cotton cloth in Georgia, South Carolina, and North Carolina grew from ten to one hundred million square yards, while, Pennsylvania's output stayed at thirty million. Although the Pennsylvania textile industry had peaked, it remained a viable industry throughout most of the twentieth century. One major adjustment was a shift from fabric to apparel manufacture. By 1940, Pennsylvania was the number three state in apparel manufacture, and women's clothing was the state's fastest growing product. Between 1920 and 1940, nearly three-fourths of the state's forty leading manufacturing industries had declining shares in national markets. 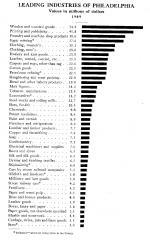 The most pronounced declines occurred in the most established industries–coal, iron and steel, railroads, and textiles. A Mack Brothers Motor Car Company 5-ton truck, Allentown, PA, 1905. In the twentieth century, Pennsylvania developed some of the newer, consumer-oriented industries. One example was processed food generally and snack foods specifically. 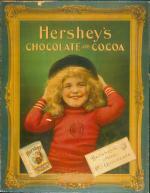 Of course, there was Hershey in chocolate bars, but Pennsylvania also excelled in ice cream, pretzels, and potato chips. The Pittsburgh firms Alcoa and Westinghouse gave the state a major stake in the new aluminum and electrical industries, respectively. Having long been a center for the production of chemicals and pharmaceuticals, Pennsylvania shared in the rapid growth of this industrial sector in the twentieth century. The new textile fiber rayon was first manufactured in the United States in Marcus Hook in 1911. Although Michigan became the center of the automobile industry, Pennsylvania was home to Mack and Autocar truck manufacturers and to Harley Davidson motorcycles. When radio listening became a favorite American activity in the 1920s, several Pennsylvania firms made the popular electronic device. That state became a center for electronics during World War II when the first computer, ENIAC, was constructed at the University of Pennsylvania in Philadelphia. After the war, its inventors, J. Presper Eckert and John Mauchly, developed the first commercial computer, UNIVAC for their Eckert-Mauchly Computer Corporation. Their small Philadelphia operation soon became part of the Remington Rand and later Sperry Rand companies. With the rise of IBM in the 1960s, the locus of the computer industry moved north into New York. Even though Pennsylvania did not become Silicon Valley, the state has been able to adapt to the challenges of a global economy because of the long-standing diversity of its industries, both in terms of products and size of firms.